First Paragraph(s): Come in, please. St p out o the rain. It had been raining for three straight days, and even the regular customers were staying away. On Thursday, Thomas had the idea of posting a sign on the doors of the museum. By Friday, several letters had blurred away, ajnd the others were running toward the bottom of the page as though attempting a getaway. By Saturday afternoon, the note had turned to a sodden piece of pulp and, driven by the winds into the gutter, was carted away on the underside of a busy man's leather-soled shoe. It was only April 20, and he had already read all the books Mr. Dumfrey had bought him for his birthday on April 2, including The Probability of Everything, which was nearly a thousand pages long, and A Short History of Math, which was even longer. So he spent the morning in the attic, playing DeathTrap, a game of his own invention. It was like chess, except that instead of using a checkerboard, it relied on the patterns of a threadbare Persian rug, and instead of pawns, bishops, and knights, the pieces were various things pilfered from the exhibits over the years: a baby kangaroo's foot, which could only jump spaces; a dented Roman coin that could only be spun or flipped; an old shark's jaw that didn't move but conquered pieces that came too close by swallowing them; a scorpion tail that paralyzed other players so they lost a turn; an armadillo toe that could be used by any player, depending on who was in possession of the armadillo shell. Esteemed Reader, we are in for a treat this week and we'll have two first's for this blog: our first two-authors-for-the-price-of-one author interview as we'll be joined Thursday by Lauren Oliver and the mysterious H.C. Chester. But wait! There's more! We'll also have our first ever character-interview with Andrew the Alligator Boy who will be here exclusive to Middle Grade Ninja tomorrow!!! 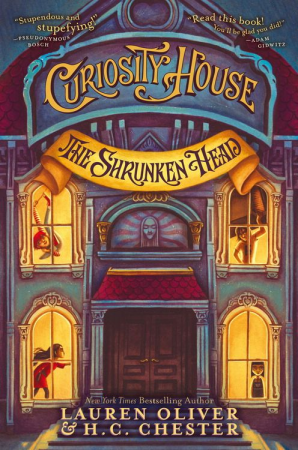 I thoroughly enjoyed Curiosity House: The Shrunken Head and I think you will as well. It's one part superhero comic, one part horror comic, one part mystery, and many many parts just plain comic as I found myself laughing frequently. This book was right up my alley and caught my interest going in with the title alone (and the fact that I knew in advance there would be an Alligator Boy in the offering). 'Curious' or "curiosity" are good words for a title, a way to prompt and condition the reader to be hooked with "shrunken head." Yes, there are no doubt some readers who will be turned away by these words, but honestly, this story probably isn't for them anyway:) For the rest of us, the promise of a shrunken head is an excellent prospect because where there's a shrunken head, there may be more strangeness and possibly grossness in store. If the only thing we had to bring to our awareness was the book's title on a plain list of book titles, I think it would stand out nicely. We're going to talk about the book and some substance momentarily, Esteemed Reader, I promise. But I've been making an effort to approach books with an appreciation beyond the experience of just reading them as I now have books of my own to market and continue to produce. You know I love my ebooks, but the Harper hardcover edition of Curiosity House: The Shrunken Head is an argument for why print books remain relevant. The artwork throughout is excellent, right down to the doodles at the start of each chapter, and the dust cover is not only well-designed to look sharp, it has raised lettering in gold that I could feel on the tips of my fingers as held it open. ...In addition to the coat check and refreshment stand--which sold gumdrops, caramel-coated popcorn, and root beer--the first floor housed two exhibition spaces. One was the Odditorium, where the live performances took place. The other was the Hall of Worldwide Wonders, which contained more than one hundred items hand-selected by Mr. Dumfrey, including an Eskimo seal-hunting spear, the headdress of a pygmy witch doctor, and a carved wooden platter used by Polynesian cannibals; and a large, open gallery of glassed-in exhibit cases, containing anything from a tiny doll-like figure floating in a jar of alcohol, said to be a genuine changeling baby from the British Isles, to a mummified cat found in King Tut's tomb. "'But normal is precisely what these children are not, as this journalist knows firsthand. Thomas Able, Philippa (Pippa) Devue, Sam Fort, and Mackenzie (last name unknown) have achieved notoriety due to their freakish, some would say unnatural, abilities. A body as limber as an elastic band; the ability to read minds, or at the very least, pockets; a preternatural strength; a ferocious and deadly skill with knives: these are some of the strengths of this group of freaks, of human abominations.'" Mr. Dumfrey's voice wavered. "You might as well know. The museum is broke. The head was our last chance at paying our debts and keeping the doors open. Now, I fear, we are sunk." The tone of the story is a bit dark, which I enjoyed now and would've enjoyed when I was the age of the target audience. I especially appreciated the descriptions of the dead bodies along the way and when I did some poking around online to discover the true identity of H.C. Chester, I was not entirely surprised to discover he writes much more adult fair involving serial killers and all other manner of delightfully unwholesome things. Not to worry. The content of Curiosity House: The Shrunken Head is entirely age-appropriate, but with just enough of an edge to pique the interest of the horror hound in me. The Viceroy Theater, on the corner of Eighth Avenue and Forty-Fourth Street, had seen better days. Only one of every four lights encircling the marquee was still working; the majority had burned out, been pecked apart by pigeons, or been shattered by vandals. The carpet in the lobby was threadbare, the chairs creaked awfully, and large water stains decorated the faded silk walls. Still, it was one of Sam's favorite places. he loved the smell of buttered popcorn that clung to the upholstery, and the old movie posters displayed on the walls, in part to conceal the water stains. Most of all he loved the darkness. Sitting in a movie theater, he could be just anyone: a normal kid from a normal family, out to have a normal good time. For once, he was the one who got to watch and point and laugh. There's more to be said, but Little Ninja is pulling on my arm because I promised to take him to the playground this morning, so I guess that's the end of this review. Curiosity House: The Shrunken Head is a well-published and well-written book that's made especially to be read on a cold night in front of a fire, or at the beach, or also in a tub... read it wherever you like, but don't miss it. She loved Mr. Dumfrey dearly, but his mind, it seemed to her, was like one of those Chinese knots that Thomas often worked his way out of in his solo acts: strings all over, everything a tangled mess. Max really wished he would stop spouting off about probabilities and statistics and boring numbers that made her head spin. The problem was all the reading he did. A nasty habit. "I'm very disappointed, Thomas," Dumfrey said, shaking his head so that the skin underneath his chin wobbled--as though it, too, were disappointed. After the close, warm atmosphere of the room upstairs, with its smells of old cigar butts and cheap aftershave and mildew, the air was as delicious as fizzy bottle of soda. "You'd have to be dumber than a dung beetle to think Mr. Dumfrey could kill anyone," she continued. Sam did not say that he wouldn't be surprised if Hardaway and Webb were dumber than dung beetles. He just said, "Who did kill him, then?" "I wouldn't bet on it," growled Andrew, and then picked up his soup and began to slurp. "Must you eat like an animal?" Miss Fitch said. "I'm the alligator boy, ain't I?"